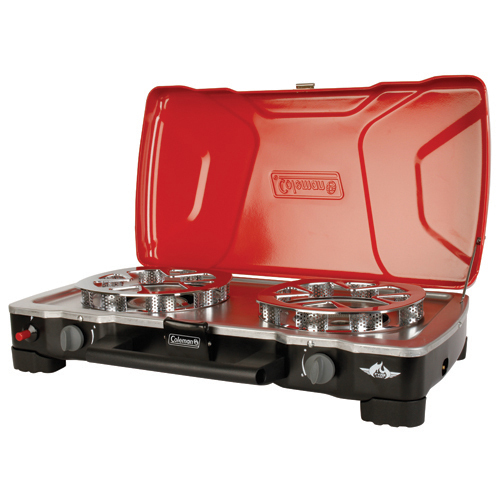 Serve up a family feast in no time with the Coleman FyreSergeant 3-in-1 Propane Stove. Each 11,000-BTU burner utilizes revolutionary HyperFlame technology, which provides an even heat distribution across the pan and better wind resistance to cut boiling time in half when compared to a standard burner in 3 m/sec wind. Wind Block pan supports also provide 360� of wind protection and eliminate the need for side panels so you can use up to a 12-in. and 10-in. pan at the same time. It comes with two Swaptop compatible grill grates, which can be changed out with the included pan supports or a griddle (sold separately) to expand your meal options. The grill grates each incorporate a DripTrap water pan that catches grease for easy cleaning in the dishwasher. When you're ready to cook, just hit the Instastart push-button ignition and dial in your heat with the two independently adjustable burners. The PerfectFlow pressure control technology produces a steady fuel stream and consistent burner performance in all kinds of weather. When you're done cooking, the built-in handle and latching lid make for easy carrying back home until you're ready to create your next camping culinary masterpiece.